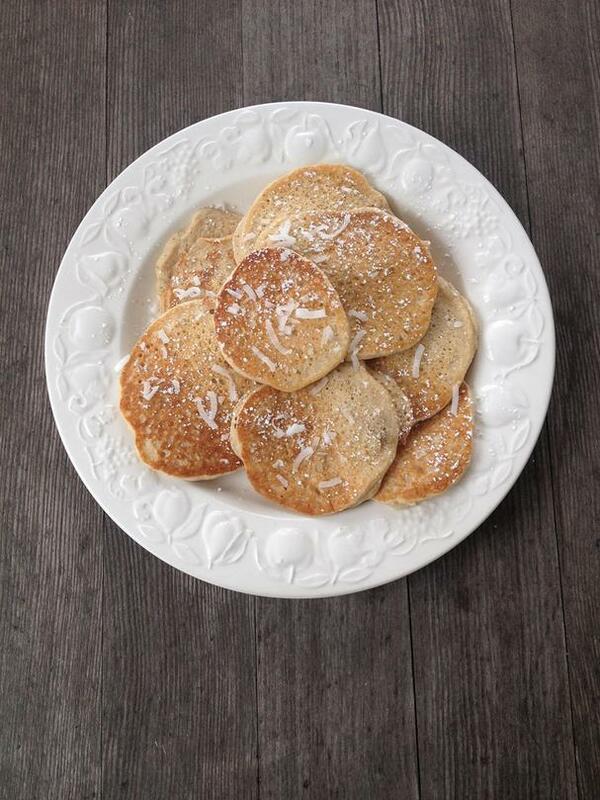 You don't have to be gluten free to love these tasty coconut pancakes! They're made with white rice and coconut flours as well as tapioca starch, which are blended with almond milk, eggs, shredded coconut, agave nectar and vanilla extract. We love them topped with a fresh berry compote - or simply on their own! In a separate large bowl, combine the shredded coconut, rice, flour, coconut flour, tapioca starch, baking soda and salt. Make a well in the center of the dry ingredients. Pour the almond milk mixture into the well and stir until just combined. Heat a griddle over low heat. Lightly brush the griddle with grapeseed oil. Ladle 2 tablespoons of batter per pancake onto the griddle and cook until bubbles appear near the center, about 2 ½ minutes. Carefully flip the pancakes (they will be delicate) and cook until golden, about 1 ½ minutes. Repeat with the remaining batter.